Greetings from South Texas where we are in Spring Time! I really missed the winter that was predicted – cold and rainy! Oh well, try again next year. 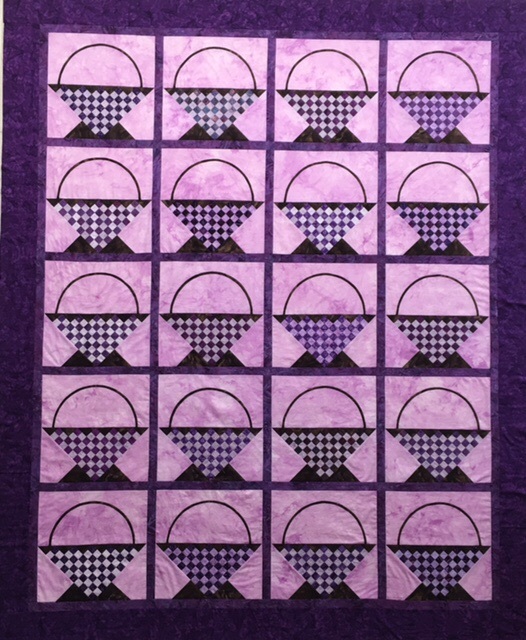 Today I did a 10 hour push and finished the Basket of Scraps quilt now called Empty Purple Baskets! I did not think I could stand another day of this quilt! Ever feel like that when working on a project that could cause a quilter so many problems? It feels good that I do not have to think about this one for a while maybe NEVER! I am thinking that I may hand quilt this one someday! I do not think it is show quality because there is minimal color movement in the quilt and I was not going to spend any more time on it appliquéing stems and leaves. So the baskets are “empty”. This is not the best picture of the quilt, I just wanted to take it and get this albatross off my design wall. The quilt is now hanging on the “to be quilted rack”. It may stay there a long time! Needless to say I am very disappointed in it! The lavender background is overbearing but I chose that fabric in the throws of wasting my original fabric which was a pretty tone on tone! Oh well, lessons learned ALWAYS do a practice block and if it does not come out right – throw the pattern away! If I had not already completed 350 2″ 4 patches, I would have done that! Tomorrow I will be starting the preparation work for Civil Ward Bride – FINALLY after 4 years of wanting to do this quilt! I am only 5 days behind schedule in getting 5 blocks prepared and ready for applique, but who’s counting! I have the Basket headache gone and it will be fun working on CWB! Have a blessed day and am looking forward for Super Tuesday – There will be winners and losers – isn’t this fun? ← Baskets of Scraps and Is it Summer or Spring here in South Texas! Which version of the Civil War Bridge will you be working on? Morning Karen. The main pattern will be the Lost Boy Quilt by Barbara Korengold. She followed the original quilt but changed the border. Then I will use some of the animals from Patricia Cox’s Folk Art in NYC. Threadbears (Australia) CWB has some things I like also. The 4th pattern that I will take from is A Bountiful Life – Karen Mowery. The Lost Boy quilt blocks are 20 14″ x 14″, Pat’s are a little larger and only 9 or 12 blocks, Karen’s have a Groom block, and the Australian version has 11″ x 14″ block. I am going to enjoy this project as I will have other quilters quilting along with me. You can google the names of the patterns and see the differences. Thx for commenting. Thx. I will finish the later this summer. The need some leaves and vines!